• 2 bath, 1 bdrm 1 1/2 story - SOLD - Tradtional & Elegant! 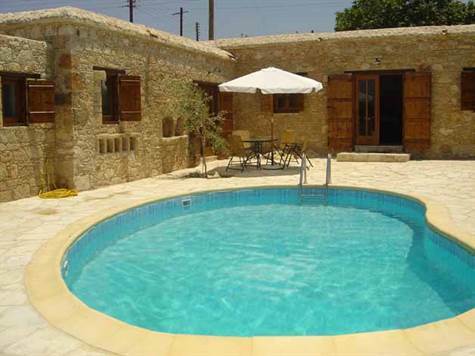 Polis Chrysochous, Paphos - This is a single storey one bedroom stone built cottage with its own private kidney shaped pool. The bedroom has an ensuite bathroom complete with Jacuzzi bath. Additional shower, WC and wood burning fireplace in the living area. It consists of a living room/dining area and fully furnished kitchen (includes dishwasher, washing machine, electric oven, microwave and large fridge/freezer), sofa beds (for daily use i.e. comfort in mind even for adults!). Ideal for upto 4 adults or 2 adults and 2 children.